How to create MOD10 human readable only field using the Barcode Label Software? 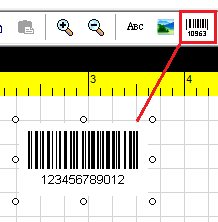 I am using the Barcode Label Software and I need to produce a human readable field that calculates MOD10 check digit without having the barcode as part of the field. 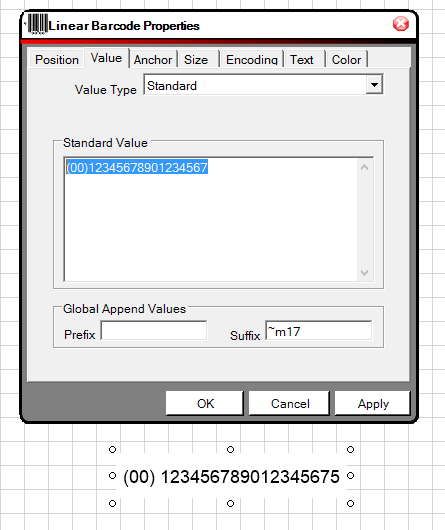 When I add the ABC text field, there is no option to calculate the MOD 10 check digit. Is this possible? In some cases, the user may want to produce the MOD10 check digit for Code 128 (GS1-128 barcodes) without including the barcode. Although the ABC text option can produce different text, it cannot calculate the check digit for barcode specifications. 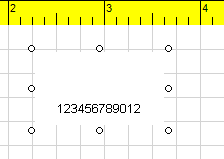 In this post, I will provide a way to calculate the check digit for a human-readable barcode field. The example uses the Classic Mode (View) Label Software. Let's calculate the MOD 10 check digit for this SSCC18 barcode data and only display it as the human readable. 1. Add a barcode to the label. 2. Double-click the barcode to access its Properties. 3. Select the Color tab. 9. Select the Encoding tab. 11. Select the Value tab. 12. Enter the data (00)12345678901234567 in the Standard Value text box. 13. Enter ~m17 in the Suffix text box. 14. Select Apply and OK.